Golf in Portugal is high quality with some of the best weather in Europe. 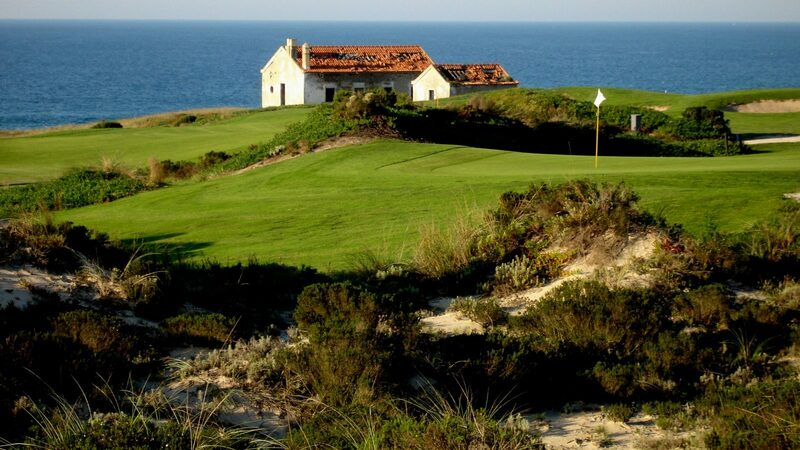 The best Portugal golf courses include Oitavos Dunes near Sintra, San Lorenzo in the Algarve. Aside from great golf, a vacation to Portugal offers port wine, fresh seafood and excellent cuisine. The top areas for golf tourism are Sintra on the outskirts of Lisbon and the Algarve on the southern coast. The Lisbon area includes this cities attractions plus nearby delightful fishing villages and considerably more. From Sintra south to the Algarve is approximately 3 hours by car. The Algarve is better for shopping, beaches and restaurants but not touring attractions. Combining both can make for a perfect Portugal golf vacation. Arrive in Portugal at Lisbon airport, meet your driver and prepare for a short 20 min drive west to check-in at the costal Oitavos Hotel. The Oitavos Hotel is a five-star deluxe hotel overlooking the western Atlantic coastline. The Sintra Mountains and Europe’s most westerly point, Cabo de Roca, can be seen from its setting along the Estoril Coast. The Hotel is overlooking the Atlantic Ocean and the Oitavos Dunes golf course, surrounded by a nature environment, yet is only 20 minutes from the airport. Play Oitavos Golf Club located on the hotel grounds. The course is located in the Natural Park situated between Cascais and the hills of Sintra, it is a course that has been designed to take advantage of its environment and the sea views through the pine wood forest surrounding the holes. The superb design and immaculate condition makes this Lisbon’s finest course. The course offers fantastic facilities and is well known for the many well placed hazards to ensure golfers of all levels are challenged. Play Penha Longa Atlantic Course. This is located about 10 to 15 min away and is an 18-hole, par 72, championship course offering breathtaking views over the ocean with Estoril and Cascais to the South and the Sintra hills to the North. Penha Longa’s Atlantic golf course has played host to numerous competitions including the Portuguese Open. Play another round at Oitavos or choose to break for golf on this day. There are plenty of options in this recommended region of Europe not the least of which includes simple relaxation on the beaches on the spectacular Estoril Coast. Visit Lisbon nestled against 7 hills on the north side of the Tagus River. Many of Lisbon’s attractions are within walking distance of each other in the central city area. You can also visit the idyllic, historic and picturesque town of Sintra nearby. The costal town of Cascais is another sight that became popular in the 19th century when the Royal family started to visit it regularly and it is now a cosmopolitan town with luxury boutiques and a wide variety of outdoor cafes and restaurants. Morning check-out and meet your driver. Prepare to transfer south to the Algarve, about 3 hours away. Upon arrival in the Algarve region check in to the 5 star Dona Filipa Hotel. The Dona Filipa Hotel is magnificently located overlooking the Atlantic Ocean, Dona Filipa & San Lorenzo Golf Resort welcomes guests with a touch of glamour combined with an essence of true quality. Guestrooms open to balconies with golf course, sea or ocean views. This 5 star property combines modern amenities with old-world charm. After check in this afternoon play San Lorenzo, the most famous golf courses in the Algarve available exclusively to guests of the Dona Filipa Hotel. San Lorenzo has been rated in the top 10 in Europe was designed by Joe Lee and opened in 1988. 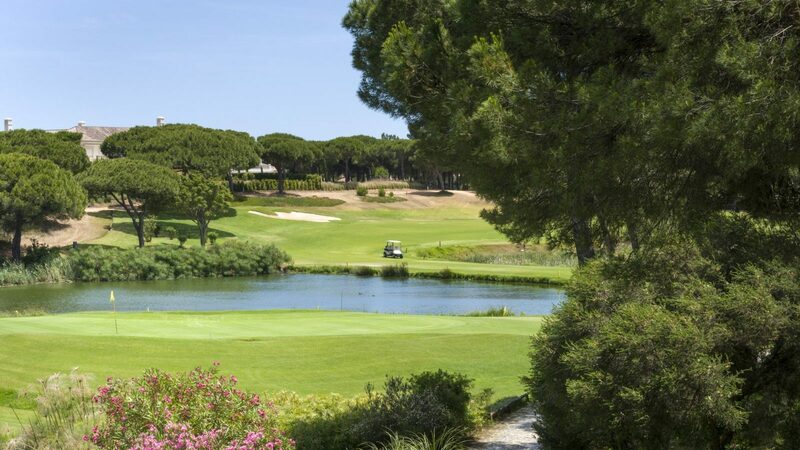 The layout takes full advantage of the wonderful undulating pine woodland topography of the Quinta do Lago estate. The course sits in the unspoiled south east corner of Quinta do Lago, bordering the Ria Formosa nature Reserve and Estuary. Play Quinta do Lago just a 5 min drive Dona Filipa Hotel, Quinta do Lago South Course has played host to the Portuguese Open 8 times. Designed in 1974 by William Mitchell, who raised the bar by introducing American-standard greens, tees and bunkers to the Algarve, it soon gained a reputation as one of the foremost courses in Europe and remains to this day one of the flagship European Tour Courses. Play Oceanico Old Course situated in the heart of Vilamoura a 20 min drive from Dona Filipa Hotel, it’s one of the oldest in the region and renowned all over the golfing world. The ‘Grande Dame’ of Algarve courses, it meanders throughout impressive pine trees over gently undulating natural terrain. Opened in 1969 and designed by Frank Pennink. Play Mone Rei located about 45 mi east of Dona Filipa Hotel. Mone Rei golf course set in the picturesque foothills of the Eastern Algarve, with sweeping views of the Serra do Caldeirão mountains to the north and the Atlantic Ocean to the south. This Jack Nicklaus signature course “Monte Rei North” opened for play in June 2007. The golf course’s presentation is highly individual, fairways and greens are bordered by several lakes, indigenous plants, native grasses and trees adding drama to the landscape. Check-out and transfer back to Lisbon or fly home from Faro Airport in the Algarve. Oitavos Hotel outside Lisbon and the Dona Filipa Hotel or The Lake Resort in the Algarve. Portugal golf packages are fully customizable! Self drive packages are also available with any custom request!